2. The Golf R is "faster"
The R may well be faster off the line but a sorted GTi (PP) with decent tyres won't be far behind and on the run it's lighter weight does tell. My stage 1 PP has left many an R driver wondering why they are carrying around a heavy 4WD system, paying much more insurance and undoubtedly a little more per month on the PCP. Most importantly - I've never wanted an R - the GTi was on the car bucket list - box ticked. Amazing looking Clubsport there! That was really lucky to find one sat in the dealers. As for the R, it’s undoubtedly a great car. It’s the car I thought I’d like more despite my gti history. It’s the car I’ve come so close to buying so many times but just not been taken by it as much as I though I would have been. For me, especially currently having an S3, I thought it would be the natural choice. It’s not like I didn’t like the R, just a sucker for a gti I suppose! Much more insurance? My R costs less to insure than my old GTD and only £12 more than our Polo GTI+, and I've been maxed out on no claims for 12 years, and haven't passed any significant age milestones to reduce my risk recently. 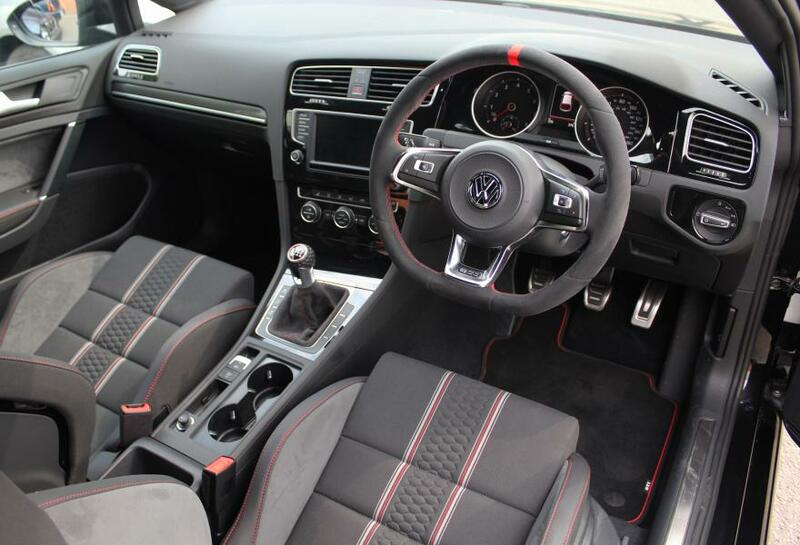 I'd imagine a declared remap on a GTI will cost more to insure than a stock R. Of course you can remap an R and open the performance gap right up again. The R costs very little more on PCP due to higher cost being offset with markedly better residuals. The R used to be significantly cheaper than a GTI on PCP when it had the sky high GFV. Back then in late 2014, between the £18500/3 year GFV and the dirt cheap leases, no one was buying a GTI. So with those 2 factors out of the way, it's a matter of preference. The current Polo GTI drives very much like a Golf GTI it's only about 40Kg lighter, but feels very sharp in handling like the Golf, when compared to the R. Completely different character to the R - which is like an unflappable tank with a lot more at the top end than either of the GTIs, and that obvious 4WD standing start traction. With all that though, by the time you've wound either GTI up to the red line in 3rd you'll be under the scrutiny of the speed cameras even on the motorway. I've had my R far longer than any other VW bought from new (I'm on my 9th). The biggest spoiler for me is the absolutely sh!te tractor/JCB grade manual gearbox. It's definitely more fun to drive if you have the opportunity to wind it right up, it's quick enough to not feel a bit dead due to linear power delivery that all post 2012 VW models seem to suffer from. I suppose the remap does the same thing. I find the Polo GTI+ as fun to drive, but in a different way - agility vs the R's raw power delivered in a hugely composed way. Truth be told, by the time you get over the fact you've lost about 0.8s to the 4WD, there's not much difference to the rest of it for the Golf or Polo GTI. 30-100mph will be significant. All that power and only legally being able to use a fraction of it every day. It does get annoying when people say "Why didn't you buy the Golf R", not gonna lie. But at the same time if they're saying that they probably don't know about the Clubsport otherwise they wouldn't ask that question in the first place. I have also owned both a GTI PP MK7 and Golf R MK7, and after the nightmare year I have had am glad to still be able to drive and not carting myself around in a wheel chair. From my personal point of view on everyday A and B roads (not track) there is not a lot of difference in the GTI PP and Golf R apart from standing start traction on the Golf R (No more front wheel tramping on the days with wet/cold roads like my GTI PP did) and of course the extra bit of power and speed when driving the R. I have to say Both cars put a smile on my face and I was extremely happy to own both. However for my personal preference the Golf R is my favorite of the two cars as since day one of ownership it has been so effortless to drive and to this very day nothing has phased it. The car you like out of the GTI or R will be a personal preference thing. Some will say they like the R better than the GTI and vice versa. I have had both and liked both but on the MK7 I personally have to say the Golf R has won my heart. If I did track days the answer may be the same or different, who knows but for the driving i do day to day the Golf R ticks every box for me, yet the GTI PP comes a very close second and will always have a place in my heart. As for those who buckle or get wound up by peer pressure when people say such things as 'you should have got a Golf R'. Just ignore it and get the car which suits your needs and puts the biggest smile on your face, after all the car is for your pleasure not theres, and to be honest they are probably jealous whether you bought a GTI or Golf R.
Some great points here. Both brilliant cars and tbh we are spoilt for choice. I agree that it is a completely personal choice and you should buy a car because you want it if you can. I couldn’t care less what others think about my choice really. I get lots of admiring looks with the S3, which has been great, but I know I’d rather have a golf. Most members of joe public would think that’s crazy. I’m waiting until January, if there’s no tcr I will add a pan roof to my order and be back in a gti after a 3 year absence. When you eventually buy your Golf, whethers it's a Golf GTI, GTI TCR or R, I hope you enjoy it mate. Since getting my first Golf which was GTI PP in 2013 I personally I will not be looking at other makes for a long time as the Golf has it all for me.